That pun is in honor of my good friend Lou - a prodigious creator of horrifying puns. Lou's graduate thesis in landscape architecture centered on an island in Boston Harbor that had been a landfill for the better part of a century. Back in those days, people wantonly discarded everything and recycling was not a commonly used word yet. Today, people take more responsibility for the impact they have on the environment. I did a little digging (puns again) to find out what people are doing today to reduce the amount of trash headed for the landfill. 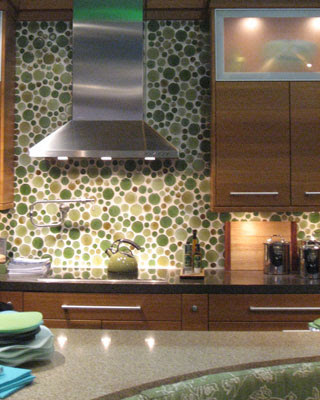 Specifically, I wanted to know what materials are available for residential design that use recycled glass. The first company whose product lines caught my eye is Hakatai. They specialize only in glass tile, have a few recycled glass options, a serious clearance selection, and some great pictures. Honestly though, not the greenest company I found but I can't resist this bamboo mosaic destined for someone's swimming pool. Bedrock Industries in Seattle makes Blazestone Tiles out of 100% recycled glass with no pigment added. 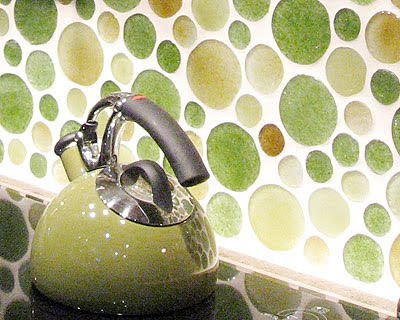 They produce some miraculous colors but I am really fond of this back splash that looks like it was made simply with the bottoms of beer and wine bottles. Two Portland OR companies I found produce different kinds of recycled glass products. The first company, Second Glass, recycles automotive windshield into glass for doors, windows, and shower enclosures. 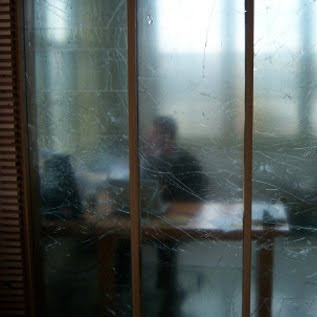 I love the spiderweb pattern of broken safety glass, and I think their products would look amazing as cabinet doors or for a privacy glass option in a bathroom window. Someone please help them with their photography though - the pictures on their website have bad lighting and weird angles. 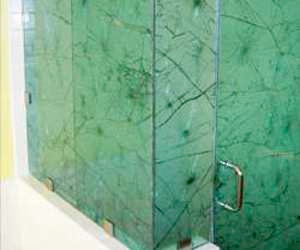 The best selection of glass tile that I came across was from Stardust Glass. 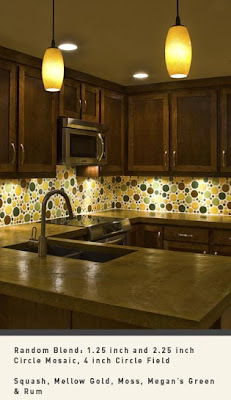 Their website has a wide variety of sizes and shapes for tile and a gorgeous palette of colors to choose from. I like some of the color schemes found in their gallery of photos. 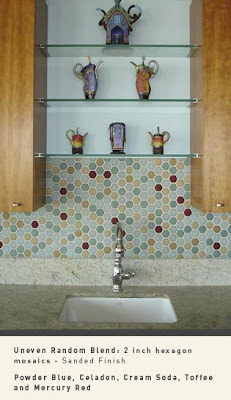 I especially like the combination of colors in the circular tile below. Take time to explore their site for yourself to get more close up photos of their work. 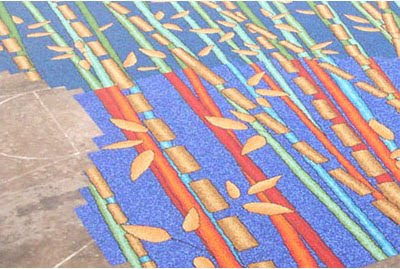 The company that makes this heat sensitive tile is Moving Color. Unique tile, although I am not sure it is something I would want in my house. Seeing its unusual properties forced me to include it here. If you would like to know more, there are lots of beautiful time-lapse pictures at their website or also you can read all about it here at www.inventables.com. I actually learned their product contains recycled glass from the details at inventables.com rather than their homepage, which makes me wonder how good it is for the environment to melt down a bunch of moodrings to make tile anyway. Well, it's wonderful that Paul's back, and I am excited to hear more about the trip. I will be posting again about this journey through recycled glass products - but I am going to approach it from a local angle. Until then....take care and beware the witch moth! Oh David, you mean "I hope you get hit in the face with a Money Bat." Great post. 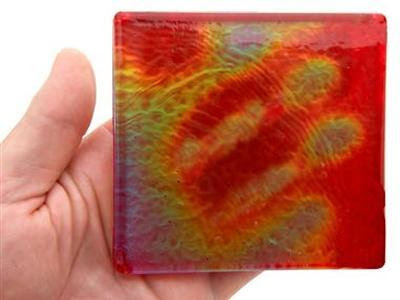 The heat-sensitive glass tile conjures too many bell bottom-clad mood ring-wearing 12-year-olds for me. Maybe it's a generational thing. I like the idea of round tile, but it's pretty impractical. I hate to sound like a suburban housewife but that's too much grout to keep clean. Oh Paul...it's all about how much grout sealer and elbow grease you are willing to apply. You definitely have tamed my fire for those round tiles though. Oh! 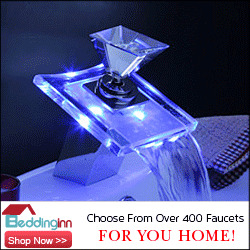 Check out Vidrepur http://www.vidrepur.us/ some time. They're a Spanish company with a Miami distributor. 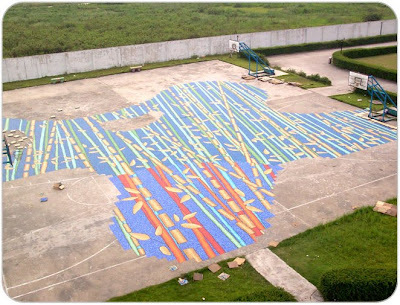 All of their mosaic tile is made from recycled glass. Get this, they have a glow in the dark glass tile. Believe it. I've seen it with my own eyes.